I’ve been spending a lot of time recently thinking about organizational change management. As I work in organizations with traditional and less web savvy audiences, using an online community is a huge change for some of these people. This is especially true for communities used inside of a company or organization where people are being asked to change the way that they work. It can be even more difficult for employees in companies with very conservative cultures where people are afraid that they will jeopardize their career by saying something that isn’t quite correct or will appear less knowledgeable as a result of asking questions. Organizational change takes time and effort with a large amount of education and training. People building online communities often underestimate the amount of resistance and fear that can come from many people within the organization. 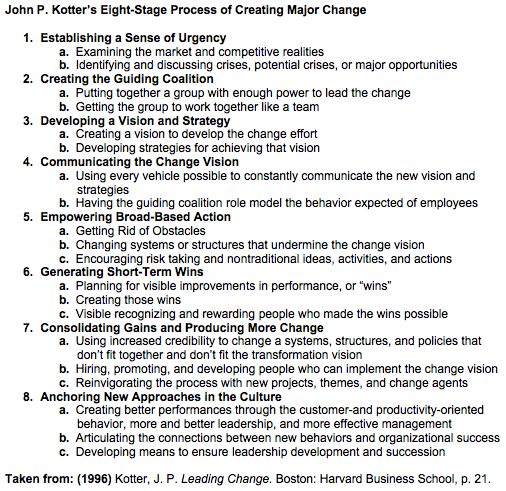 I’ve included a model from one of my favorite change management experts, John P. Kotter, not because I think you should use any particular model, but because I think it has some interesting nuggets of information for how community managers can help people through the change to a more community-oriented organization. If you are working within an organization to create an online community that people will be expected to use as part of their daily job, you need to have support from the top. Key leaders within your organization should agree with your strategy and vision for the community and support the effort. If your leadership is resistant, hold off on building or implementing anything until you can get them on board. Sabotage from the top is not going to make for a successful community. The communication and training for change of this size is not a single email announcing the new online community or a single training class showing people how to participate. Because some people will resist any kind of change, you will need to constantly communicate and train people taking as much time as you need to bring people around. It can also help to share success stories (wins) when you hear about someone using the online community to do something great. Ongoing management of the community should include continued communication and reinforcement of successful usage while also keeping an eye toward next steps. No community or other organizational effort will be implemented without ever changing. As situations change and the community or organization evolves, you will need to make new changes to the online community. These new changes can also require some organizational change. What are your thoughts on using organizational change management principles for new online communities within organizations? Previous PostBlogging ElsewhereNext PostCommunity Managers: How much money should they make? These are excellent points and especially important for those who constantly and consistently bash various industries for refusing to change or for being very slow at creating change. The newspaper industry has been criticized ad nauseum, for example. As someone who was deeply involved in creating organizational change in the deeply rooted corporate culture of a South Florida newspaper which was created by a 100-year monopoly, I understand the growing pains, change of mindset and amount of convincing it takes to move forward even the tiniest bit. Sure I criticized the mindset and was often very frustrated but I ultimately learned how to operate within the system and help the company move forward. Numbers 3 and 4 of this list helped me do that. As someone who is now a community manager I see it across all industries. I is not as easy as people may think and those who are successful at creating change work very hard at it. It goes way beyond number one, which is what man people do..create the urgency but never explain it in grave detail or provide a vision for getting there. 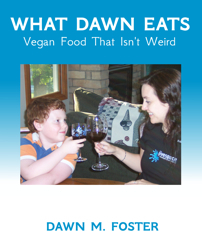 Love this post, Dawn. Thought-provoking and smart! I am going to send these principles up the chain! A great reflection on the disciplines of Organizational Change Management. Absent the why, the best consultants or tools have a sour “flavor of the day” or temporary quality about it. It makes me think of the complementary balance that is struck with new tools and increased face to face time. One of my clients has increased his volume of one-on-ones with direct reports, while also adding more skip-level meetings to his agenda to get his vision and urgency explained first hand. It is also proving a powerful way to get the feedback he needs to monitor the perceived level of importance among the line staff. We’ve also been working to “infect” a broader pool of folks from across the organization in our change efforts – including those that are typically resistant to change but are seen as informal leaders. Once these cultural cornerstones get their minds around the need for change and the power of the shift, the effort becomes more grassroots and takes on that employee-ownership quality we all hope to see. In general, these are good points though I disagree slightly with number 1, the “sense of urgency”. While it is important for employees to know the importance that their work gets done, it is also important to not create an environment of stress, which wastes energy and thwarts creativity. Stephen Covey once broke this down into a quadrant, saying that most people do their work in the “urgent, important” category when they should be really working in the “non-urgent, important” category.